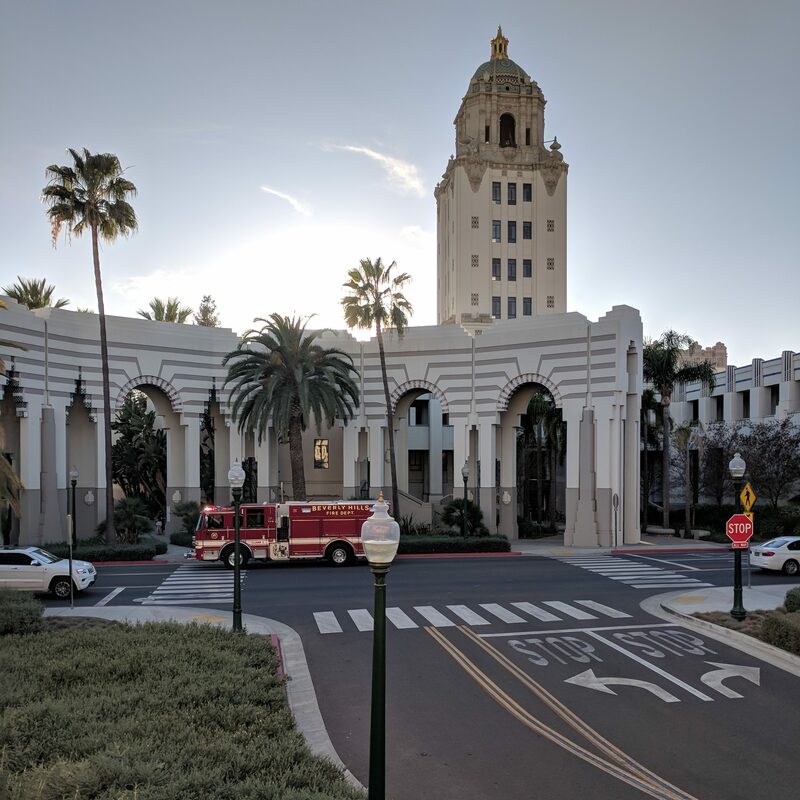 The central conceit of the Beverly Hills Civic Center is a series of oval plazas aligned diagonally across the main axis of the Historic City Hall serving to unify the with major Civic buildings – the Library, Police Headquarters and Fire Department, and City Hall itself – with a large Civic Center Parking Garage. The smallest and most intimate oval opens towards downtown Beverly Hills and the famous Rodeo Drive. 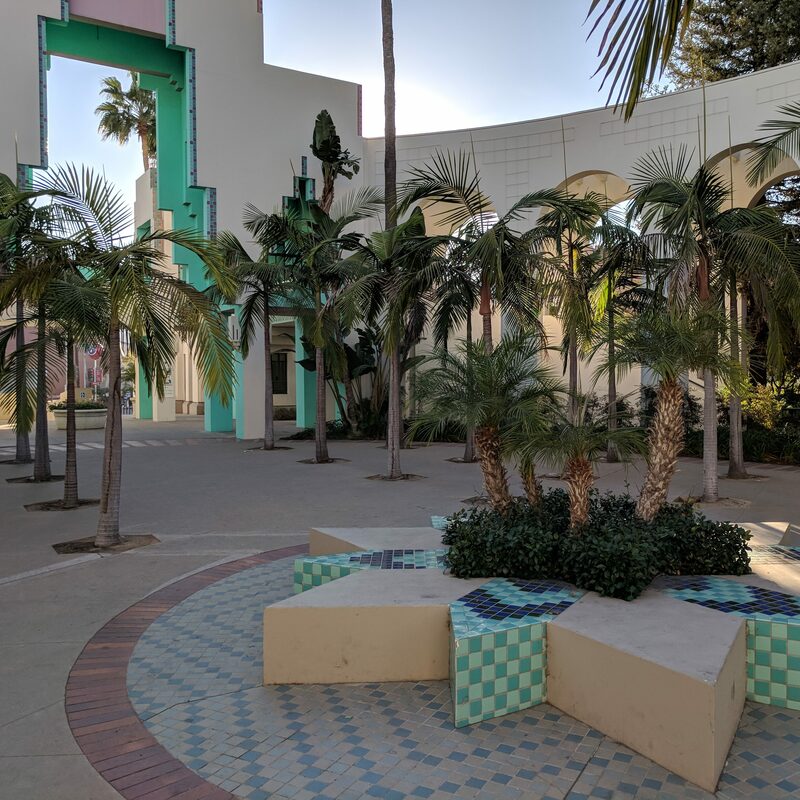 Nestled against City Hall, this plaza is centered by a grid of palm trees, small tiled planter and a gracious archway towards the City from which a now dry water channel runs to the sidewalk. It is the most conventional, and most successful, of the three plazas. 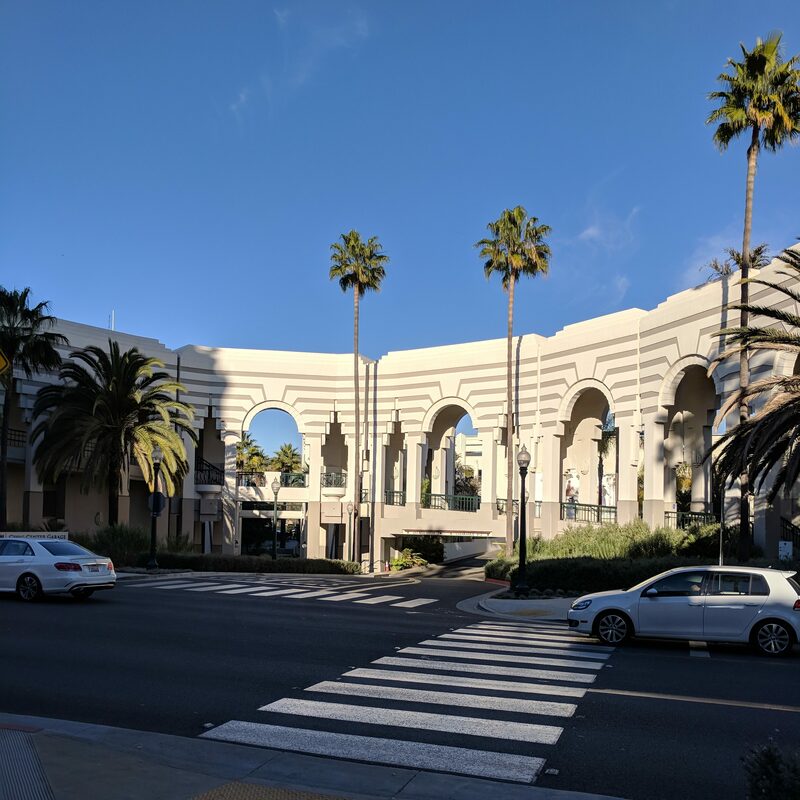 Enclosed by large free-standing peristyle, the second ovoid is cut in half diagonally by Rexford Drive and bisected yet again by driveway entrances to the Civic Center Garage. 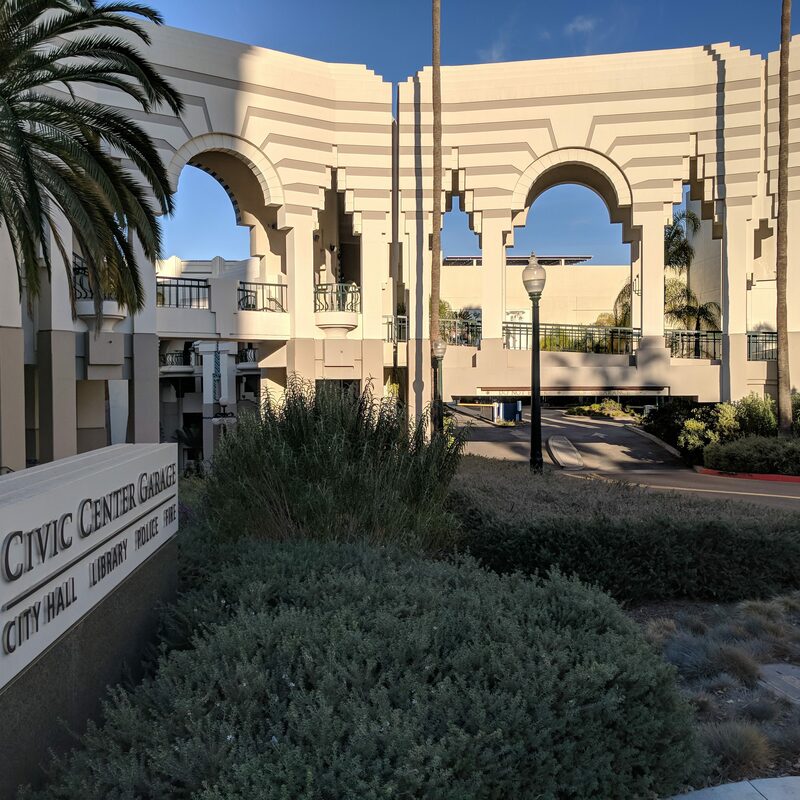 Neither pedestrians nor automobiles occupy the geometry of this ellipsis in a meaningful way – the axial pathway straight through the oval sequence is distorted by the roadway intersection and the broken arcades partially block the axial view towards the front door and tower of City Hall. The final oval plaza unifies the garage, Police Headquarters, and Library into single composition (of sorts) and frames a grand below-grade plaza. 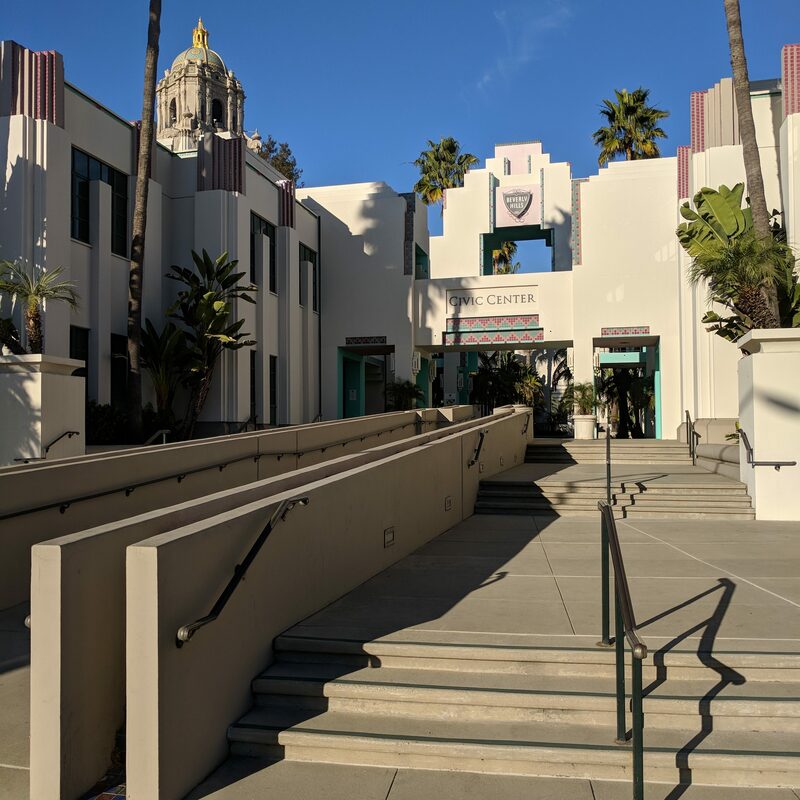 But there is little reason to occupy the floor of the plaza, as the primary entrances to the various buildings are from one of the various upper-level galleries that ring this Beverly Hills forum. Essentially an empty space, the plaza has the monumentality of a Roman coliseum and corresponding feeling of an ancient ruin. 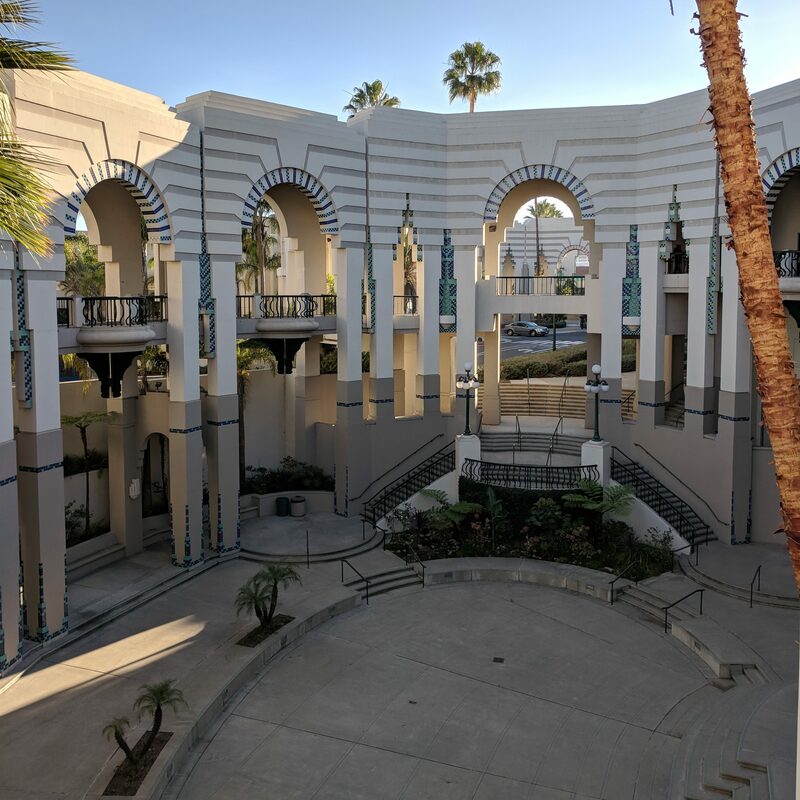 For despite all their dramatic effort, the monumental arcades that ring the elliptical plazas at the Beverly Hills Civic Center are a distraction, a stage set for civic life, if you will. In fact, the arcades are detached from the surrounding public buildings – they stand in front of, and essentially free, from the facades, of those structures. Thus entrances to the City Hall, Police and Fire Department buildings are secluded hidden behind the staircases and ramps that link the various arcades in the central oval design. For example, the wonderfully eccentric and colorful interior of the Library opens to the street through a modest corner doorway – which itself stands behind a clumsy layer of landscape from the grand Rexford peristyle. The result is a cleavage between the public interiors and the civic spaces of the plazas. 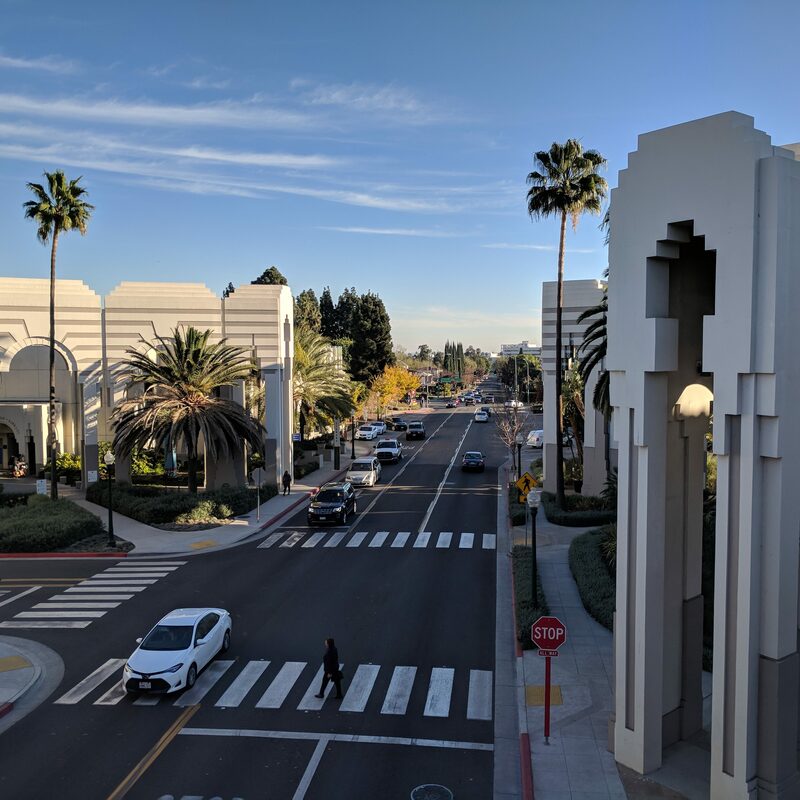 Unlike traditional plazas or squares, where buildings directly shape the public spaces as outdoor rooms, in Beverly Hills the life within the buildings and the public coming-and-goings through their doorways do not animate or give social meaning to the plazas. “Civicness” is largely and almost exclusively signified by the architectural grandeur of the peristyle arcades alone. The public life, such as it is, is hidden within the various walkways that run through and behind the peristyles. To the City’s credit, these walkways and the grand plazas themselves remain entirely open to the public. In a less wealthy City these spaces likely would have been closed long ago for fear of homeless encampments and other nefarious urban scenarios, especially given their labyrinthine character. Constantly moving up and down in elevation, these walkways are filled with passages, stairwells, bridges, and overlooks that move and pause like eddies or ox-bows in a stream. These random pauses reveal Charles Moore’s quirky sense of humor with colorful postmodern tilework and fussy decorative details, but too often Moore’s usual warmth and humanity is overwhelmed by the monumental scale of the arcades and plazas. 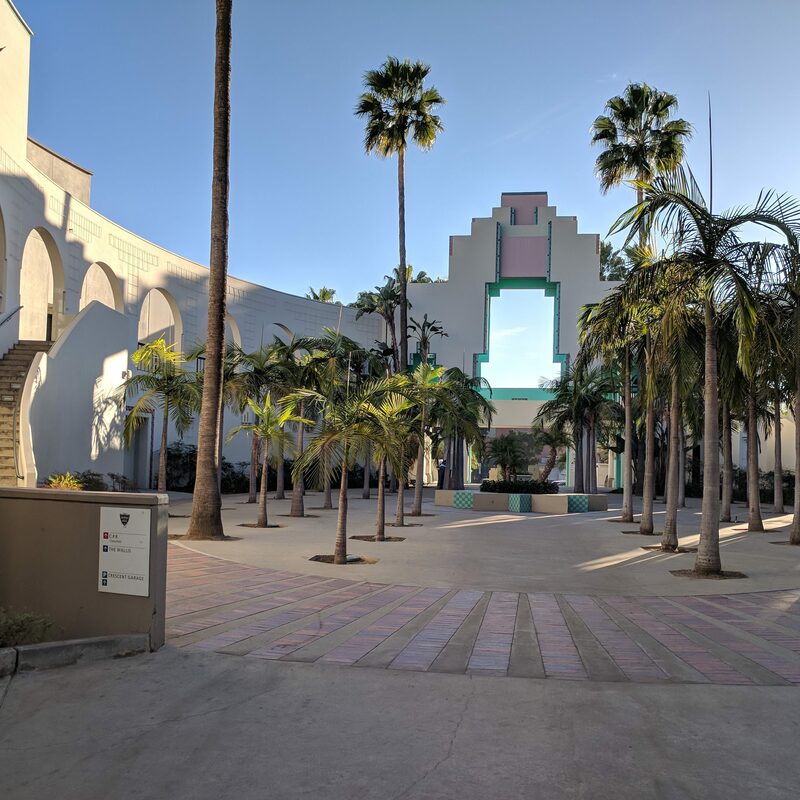 The Beverly Hills Civic Center is an astonishingly singular work of architecture. 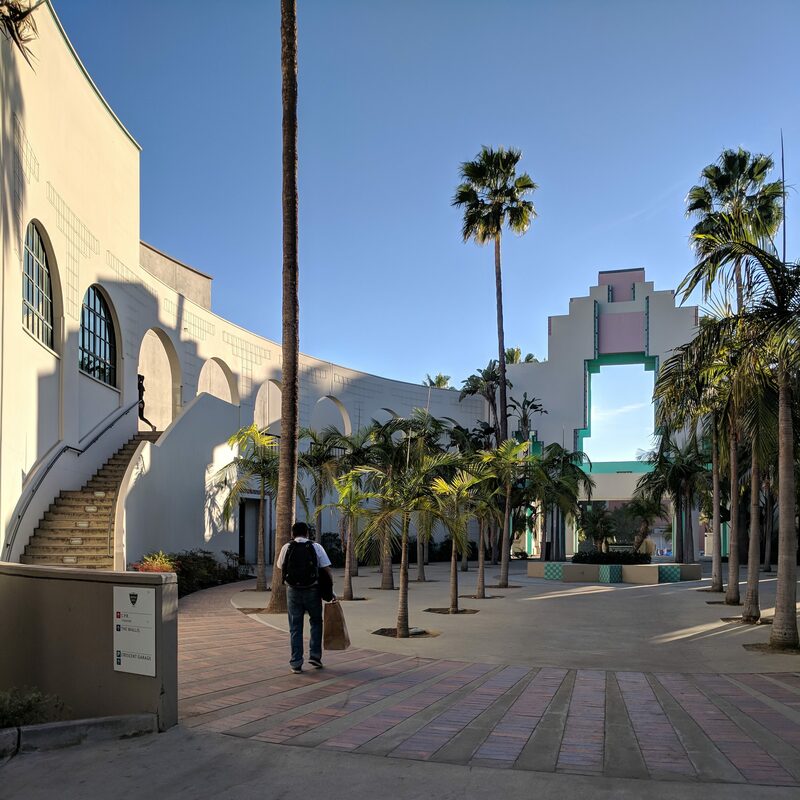 There are few places in Southern California that match the layering of courtyards, monumental arcades, theatrical overlooks, and cinematic sequences of movement found under the tower of Beverly Hills City Hall – Horton Plaza in San Diego comes to mind, where these architectural effects are employed in the service of consumption and shopping. So while in Beverly Hills you don’t have to pay for the public life, you do spend a lot of time wandering in circles attempting to find it.